The City of Carlsbad’s TGIF: Jazz In The Park Series has mostly left Carlsbadistan for the 2008 season which is kind of a bummer (no more walking to the shows), but truthfully, we don’t need those inland crowds cluttering up our streets anyway. This year the 10 events shared among Stagecoach Park, Poinsettia Park, and Calavera Hills Park. The first concert is on Friday June 20 with the Debbie Davies Band at Stagecoach Park. Follow the jump for all the other details and we will keep you posted all summer long. 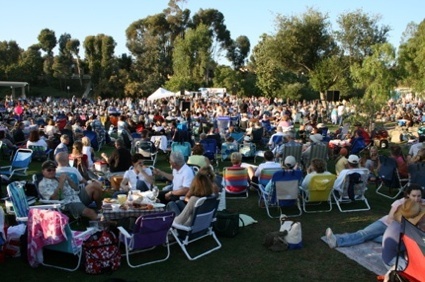 The City of Carlsbad’s annual “TGIF Jazz in the Parks” series returns for its 23rd season of free outdoor concerts in Carlsbad parks during the months of June, July and August. Ten TGIF concerts on consecutive Friday evenings will begin on June 20 and continue through August 22. All concerts begin at 6 pm and end at 8 pm. The concert series is presented by the City’s Cultural Arts Office and produced by Rob Hagey Productions, Inc. The highly popular concerts, known for exceptional quality and for a broad range of jazz and blues styles, now attract audiences numbering more than 3,000 to each performance. New features of the series in 2008 include new concert locations within two of the parks and a change in the number of concerts presented at each park site. The line-up of musical talent offers six new bands and four returning groups. The first four concerts take place on June 20, June 27, July 4, and July 11 at Stagecoach Park, 3420 Camino de los Coches, between La Costa Avenue and Rancho Santa Fe Road. The concert site moves from the lower level bowl to Baseball Field #1 on the park’s upper level. Free parking is available until 9 pm directly across the street at La Costa Canyon High School. There is no shuttle service at Stagecoach Park. TGIF moves to Poinsettia Park, 6600 Hidden Valley Road, for three concerts on July 18, July 25 and August 1. Free shuttle service will operate between 4:30 and 9 pm from two locations: south of the park at Pacific Rim Elementary School at the corner of Hidden Valley Road & Camino de los Ondas and north of the park at the Legoland parking lot off Hidden Valley Road, just north of Palomar Airport Road. Calavera Hills Park, site of the final three concerts on August 8, August 15 and August 22, is at 2997 Glasgow Drive on the corner of Carlsbad Village Drive. The concert site moves to Baseball Field #3, on the opposite side of the Recreation Center from the former concert site. Free shuttle service will operate between 4:30 and 9 pm from Hope Elementary School, 3010 Tamarack Drive and from Calavera Hills School, 4100 Tamarack Drive at College Avenue. Many patrons bring picnics; light refreshments are also available for sale. Intermission opportunity drawings are conducted by the Carlsbad Friends of the Arts to support the concert series and other cultural programs. The use of bikes, skateboards and roller blades is not allowed in the parks during concerts. Pets and personal barbeques are not allowed in City parks by municipal ordinance.